All of these are various synthetic or synthetic blend yarns in my stash, not including the huge box of leftover Red Heart yarns. You may recall that my New Year's resolution was to weave only with natural fibers this year. But if I do that, what do I do about them? Throw them away? That's shameful stewardship. Knit with them? Possible, though not all are suitable for knitting. Give them away? Well, that's a possibility. Wait till 2010? Well....... Revise my resolution to, "I will not buy synthetic yarns in 2009", rather than "I will not weave with synthetic yarns in 2009 "? That's a possibility too. 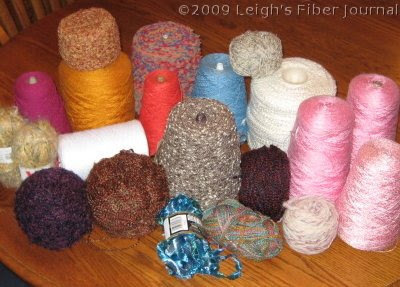 Almost all of my yarns have come from mill ends and others' leftovers. While this is due to the economic feasibility of my being able to weave, it also suits my curious and exploratory creative style. I love designing from my stash, even though it sometimes requires a lot of deliberation to find colors and textures to suit the design I have in mind. I love that entire process. But back to those particular yarns. The bottom line is that I can't bear to part with most of these, especially the novelty ones that I always hoped would provide a little visual zing to some of my weaving. Such as the outline weft in this honeycomb M's & O's sample. Or weaving blankets for Project Linus with the Red Heart because washability is a requirement to donate blankets. Then there are gifts for those who like my handweaving, but need something easy care. I am now remembering why I don't make New Year's resolutions. I think fine tuning your resolution makes good sense. I have some synthetics too but won't part with them. I reach for natural fibres to weave with but my eye likes the shiny things on the shelf. feel rightous and give them to charity. People are always looking for knitting yarn here in the UK to knit for charitable causes, whether for blankets to give to the needy or articles to sell. the point of resolutions is help you grow, not create punitive rules that confine you all year! i recommend you change the resolution to not buying synthetics so the resolution do not hobble your charitable works, general joie de weave and thrift in this economic 'downturn'. I know it's the year of natural fibers or something like that, but I would just forget about the resolution. I, for one, do not care for being "forced" into a position just because some people have thought this a good idea. And if you were to take the year of natural fibers quite to its extreme, you would have to consider processing and dyeing as well, not to mention how the sheep were fed, if pesticides were used on the cotton, what was used to clean the fibers..... Forget it and focus on your tied weaving explorations. Your expanded stash looks like fun. Well...you can always combine natural and synthetic fibers in a project or two. In fact that adds a new design challenge for you. I think I would amend my resolutions to not buying synthetic fibers. Not using what you have would be so wasteful and I don't know about anyone else but being wasteful is not in my budget. I admire you tyring to stick to your resolution! Seems to me that you are doing a great job! Hang in there! I vote with Peggy -- ditch the resolution. In fact the leading UK mental health charity "Mind," feels that New Year's resolutions can be bad for your mental health. You have gifted blankets woven from that yarn and it's practical to give something washable. I can tell you that you would be torturing yourself if you try to knit with it, after knitting with your beautiful handspun yarns. Just weave it up and don't buy more. That's my 2 cents worth. I think I might go for the modification route - as in "use more natural yarns" or "try some new ones" and put these on one side for a few months, see how it goes. I do agree that new year's resolutions can cause anxiety and so be bad for mental health. Wish I could ditch the book budget resolution - but I can't - I'd better get a warp on the new loom to distract myself! I love all the comments and advice. You will doubtless see some of those yarns pop up from time to time. At the very least I learned I was right all along - the only resolution I should make is to not make a resolution! Bobbie, I'm delighted to hear that! It's a fun group to be a part of. That's a good idea about those cones I'm pondering, Some of them I already know I won't miss, others I can think of things to do with. The guild sale would be the best way to go I think. Nothing wrong with fine-tuning your resolution, I say! I think we get a lot out of just assessing where we're at and coming up with resolutions in the first place. I'm a resolution-nut, but I know I won't keep all of them, or through the entire year, but it gives me a direction and a more-or-less consistent viewpoint from which to look at what I'm doing throughout the year.